Hmmm thanks guys. I am referring to the PPSE work units. My config file looks like this and I have BOINC set to 50% CPU usage just as they suggested on the Primegrid website. I have >5< which runs 3 WU's across 15 cores so you might be onto something there Dingo. I've noticed my PPSE run times are about 800+ seconds which seems a bit slow. Maybe I just need to stop worrying about it. That is now five members that have a P2019 Badge and one with a P2019(2). Well done I hope theree are mpre to come. 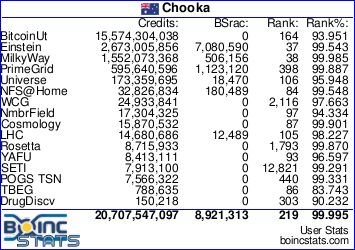 Way to go Chooka, finally. +1 as well. I'm still trying to work out the best app_config to have. I don't think >16< and running 1 x WU is the best option. Sure it will finish fast but I'll have a lower throughput. I've been using >5< to run 3 x wu's but now I might try >4< to run 4 wu's. No idea which is the right one though lol. Seems like a trade off, throughput vs speed. Oh Prime, where thou art Prime. I eagerly await for you everyday, please come home to me. Number 2 is so lonely, he wants to meet Number 3. Oh well. I think he has things pretty fine tuned. Likewise Magpie. I'm happy that I got the P badge. I've thrown MEGA into the mix also. Well done chooka you did it!! It must be a great relief to finally have a P.. I am going away in the morning so my main Ryzen machine with the 1080Ti will be off for a week. I am hoping to get at least one more Prime before the end of the month and I have four dedicated Linux servers running at 100% while I am away and I will run my old laptop when I get to where I am staying for the week. Have a good break Dingo. Must look up what a 2080Ti does!